Over Halloween weekend we decided to do the Wicked races by J and A Racing. My mom and sister drove down for a visit. This time they brought two Labradors with them. Since it was off season at the beach, we thought it would be fun for the dogs to go in the ocean and run in the sand. The day after the Wicked 10K the local SPCA was sponsoring a Pup Cake 5K run in which the dogs would be participating in. Looks like everyone was going to get a chance to run this weekend! Unfortunately, right before we left for the expo on Friday, we got notification that the Pup Cake 5k run on Sunday was going to be cancelled. They said the weather report looked bad. Something about a storm called hurricane Sandy was suppose to make an appearance! So I guess the four legged creatures would not be running this weekend after all. They would have to get their running done out on the beach later this afternoon. So we do finally make it to the Race expo inside the VA Beach convention center to pick up our race packets and goodie bag. Since this is considered a smaller race, the expo was not nearly as large as the ones at Disney or the Rock n-Roll that we attended last month. You could probably look at everything you needed to in about 20 minutes. We finished up at the expo and then headed to the beach with our dogs. 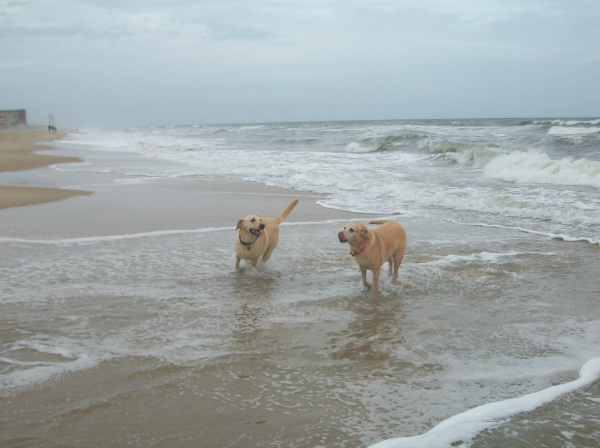 Our Labradors love the beach. Can you see one of our dogs in the background? I woke up in the morning and it was a bit chilly and windy. 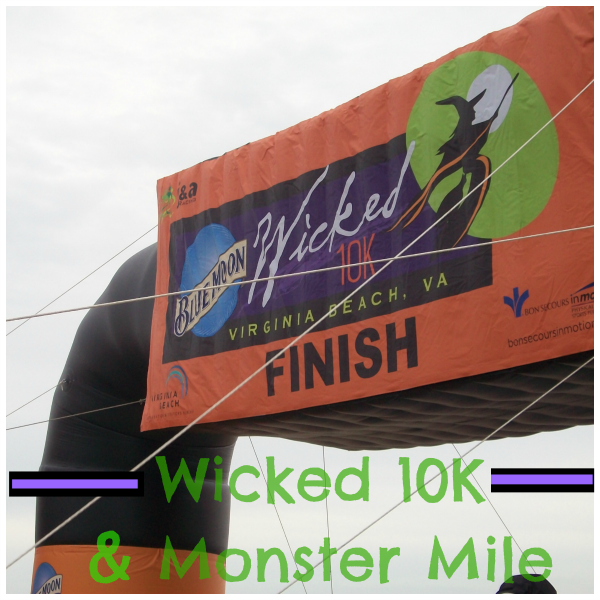 I wore my compression capri pants and my Wicked 10k shirt, with another long sleeve tech shirt on underneath. Walking to the Convention Center, I thought I should have switched my capri pants out for long pants. During the race, I'm glad I had my capris on, and should've gone with only one of the long sleeve shirts. It got much warmer throughout the day, even though it stayed pretty windy. Even though it was just a fun run, I still wanted to do well. I didn't want to go all out in a costume. I decided to play it safe and just wear black, put whiskers on my face, ears on my head, make a tail for my backside and go as a cat. Sounds simple enough, but like I said earlier, this was the weekend of Hurricane Sandy, so it was very windy, and I had to run pretty much the whole way holding my ears. I also was going through an injury at this time, so I wasn't sure how this race was going to go, since I hadn't gone that far in awhile. Since it was Halloween and people were dressed up, we decided we would dress our Labradors up as well. They were matching clowns and they got tons of attention from runners and spectators alike. 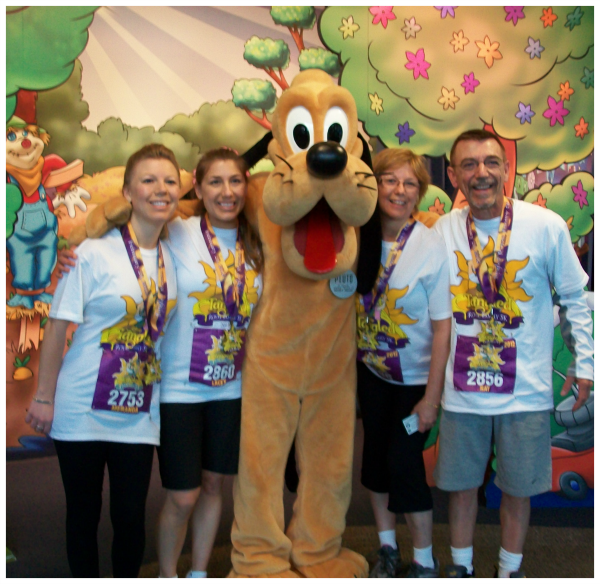 The dogs, along with my mom and sister waited for me at the start and then walked to the finish line to watch me end. This race started at the Virginia Beach Convention Center. We ran down 19th street to Atlantic Ave towards Rudee Inlet and then down the boardwalk to 10th street, back on Atlantic Ave to 40th street, then up the Boardwalk to the Finish line at 23rd street. 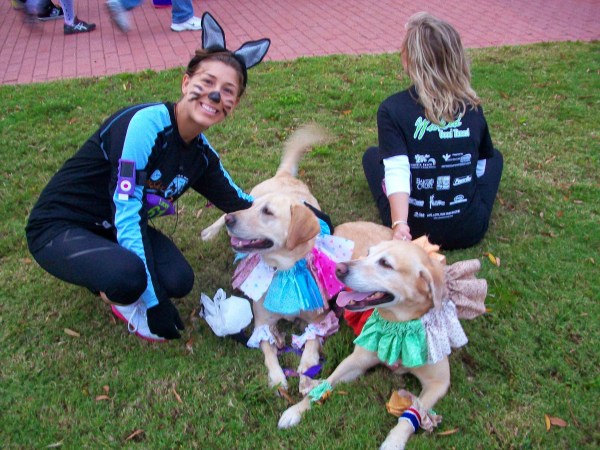 As I crossed, I could see the dogs waiting patiently for me in their costumes! They were so well behaved. The race went well and I ended up finishing in 49 mins. That's me, right in front of the bumble bee! My sister made me this great sign. After the 10K was over, my sister joined me for another fun run called The Monster Mile! This race started on 21st street, down Atlantic ave to 27th street then up the boardwalk to the finish line on 20th street. Usually this race has a fun after party at the beach with bands. But due to the weather we had to enjoy the festivities inside the convention center. The race was sponsored by Blue Moon and Bakers Crust. Everyone one that participated in either of the races got a free Blue Moon and some chili in a bread bowl. It was a good after race snack (our dogs thought so too)! This was the start of the Monster Mile. The finish line was on the boardwalk. It was the same finish line as the 10K. This is the Wicked 10K medal for 2012. 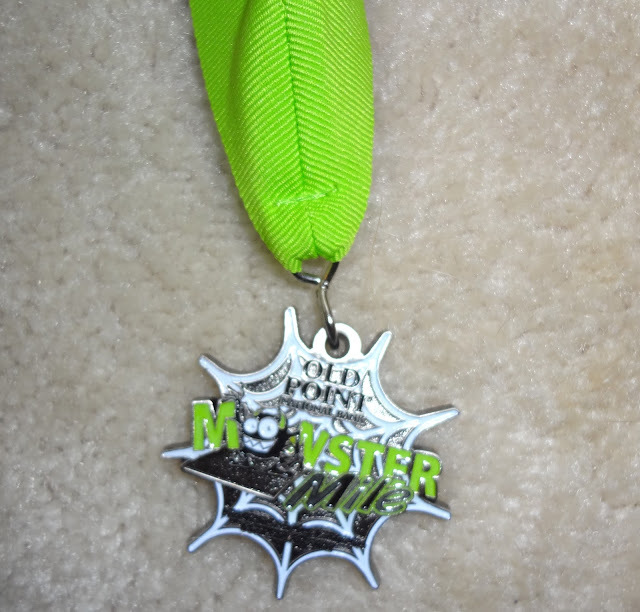 This is the Monster Mile medal for 2012. 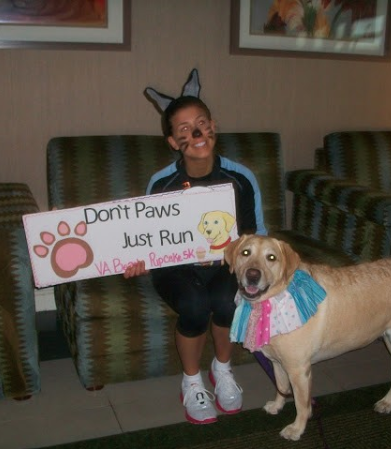 Here is a picture of the sign for my Pupcake run that we never got to do! Belle was really looking forward to her race. I was very excited to run this race, since a lot of my friends from my running group (Hampton Road Runners) were doing it as well. This would be the first race I would be doing that I could consider myself a local. 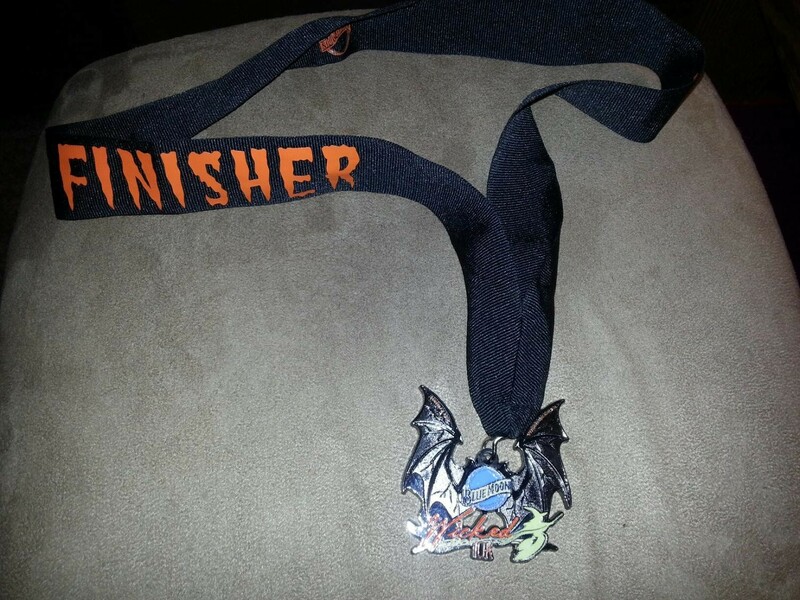 Last year I was unable to do it because I was moving the same weekend, so this time there was nothing in my way that was going to keep me from doing this race. Another reason that I wanted to do this race was because I've heard nothing but great things about the Rock and Roll Series. My mom and sister were meeting me here for the weekend to partake in the concert series and of course watch me run the race. I got these bags for registering for more Disney races. The sling bag came in handy all weekend as we rode our bikes along the boardwalk. Another highlight from the expo was getting to meet biggest loser contestants Dan and Jackie Evans from season 5. They were there promoting the Biggest loser Run Walk event that they are doing in cities across the US. Check out the website and see if the event is coming to a city near you! The morning of the race I woke up at 5 am and stepped outside and it already felt like 90 degrees and humid! I love the heat and was hoping to not have to be chilly at the beginning of the race. Another good thing about this race was it was so close to my apartment so we walked to the starting line. It was me, my mom, and my sister with her “designer” sign in tow. My last Half Marathon I did was in February at Disney. I completed that in 1:57. So of course my goal was to beat that. I thought I had a good chance of exceeding that goal, since I had been running a lot over the summer with my running group. As we got into our corals I noticed many people that dressed for the occasion. We thought Disney was the only place people dressed up for races, but we were wrong. 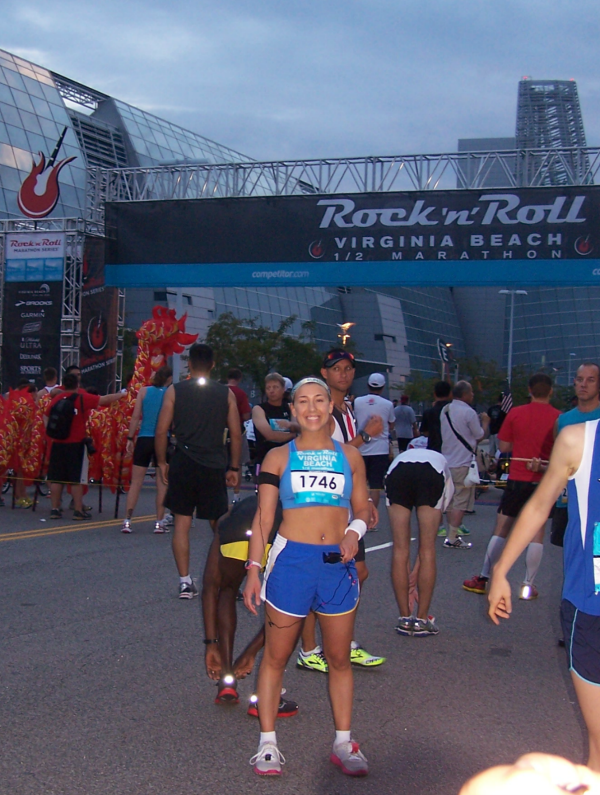 We saw runners dressed as Elvis and many 80’s rock icons. The race started at 7:00 am in front of the VA Beach convention center. The course continued down 19th street towards the waterfront and a right on 18th street until we got to Pacific Ave. We ran Pacific Ave to General Booth Blvd, which was probably the longest part of the run. After mile 6, we turned left on Prosperity Rd, did a loop around Birdneck (via Jefferson Ave and Headquarters Rd). Right after Mile 10 we were on the home stretch running Southside Rd all the way to the Boardwalk entering on 2nd street taking us that last part of the mile to the finish line on the Boardwalk at 17th street. The finish line is right on the boardwalk. During the race I felt really good. I was pacing myself well, and was in a zone by listening to my ipod. Music does really help! I was very comfortable with the course since I had been running it often with my group. By being a Rock and Roll Race I was expecting so much more music and entertainment throughout the race. Maybe I just didn't hear much, since I just said I did zone out with my own music. Either way, I was proud to say that I completed it in 1:50 even with the heat and humidity! My fastest Half Marathon to date, but surely not my last! Completing my first Rock n Roll Race. After the race was when the fun began. Not saying the race itself was not fun, but it is always a good feeling to be done! It was especially fun for my family. Days prior to the race I met the Vice President of Course Operations of the Race. He was nice enough to pull some string to get us VIP treatment! After the race, we had a complimentary brunch at Rockfish Grill at the Ocean Front with mimosas. Also, he was able to give us passes to get in to all the concerts on the beach for the weekend. The line up included The Wailers and O.A.R ( Friday), Soul Asylum and Cheap trick ( Saturday), and the best concert of all was after the race on Sunday night, Andy Grammer and three time Grammy award winner Train! This was followed by a fireworks show on the beach. What a perfect way to end a great race weekend over Labor day! 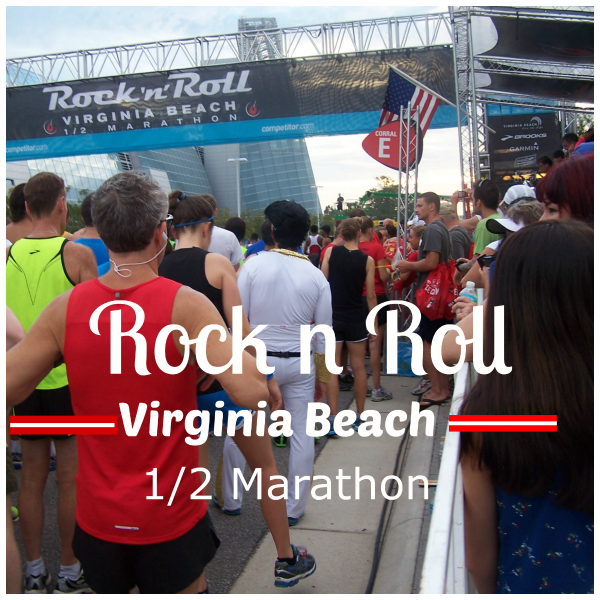 We can’t wait for Rock n Roll VA Beach 2013! Rock n Roll race medal for 2012. It is suppose to be a wave. Yesterday we had to get up early for the 5k and this day we had to get up by 3:30 am again. This was my sister first Disney Half marathon. I think I was just as excited as she was even though I was only going to be a spectator. I grabbed my “designer” sign that I made for my sister Lacey and we all headed for the “event” bus at our resort. I have since learned to make signs that are much easier to pack and transport. Magic Kingdom in the wee hours of the morning. Just a little background for those of you who have no idea what this course is like: The starting line is in a parking lot near Epcot, miles 2, 3 and 4 are along Epcot center drive, past the Transportation and Ticket Center, the Polynesian Resort, and Contemporary, mile 5 is just entering the MK. They enter on Main Street on the right hand side by Tony’s Town Square restaurant. They run all the way down main street take a right through Tomorrow land, through Fantasy land (just the old part), through the castle from the backside, through Liberty Square, and out through frontier Land. So in essence, there are plenty of spaces to watch your runner in the MK. I was able to see my sister run down main street. I got a quick pic, and then had enough time to run further down by the castle and get a pick of her running through. I wasn’t able to get a good pic, but I did see her run by. Lacey just before the finish line. 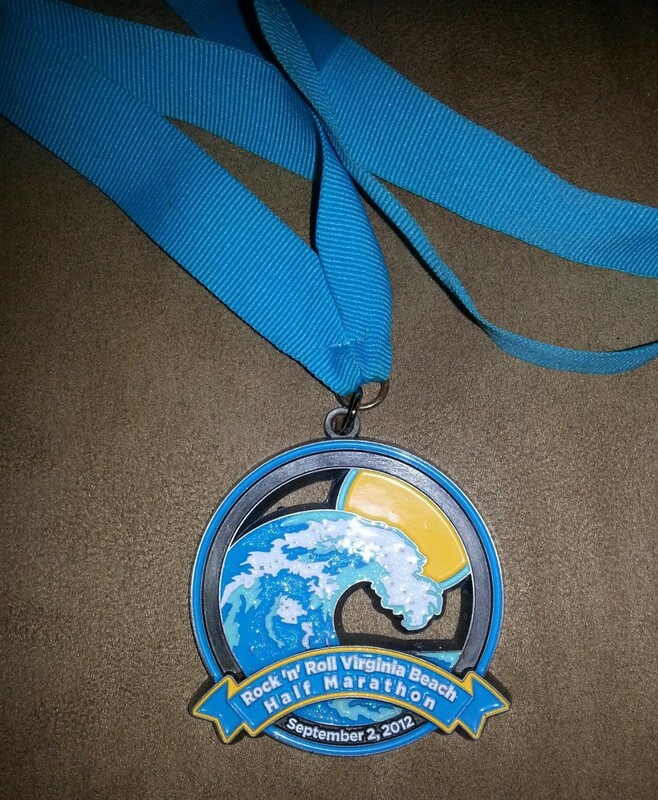 My sister’s goal was to finish in under 2 hours and she did it! Her only goal was to finish in less than two hours and she met that goal! 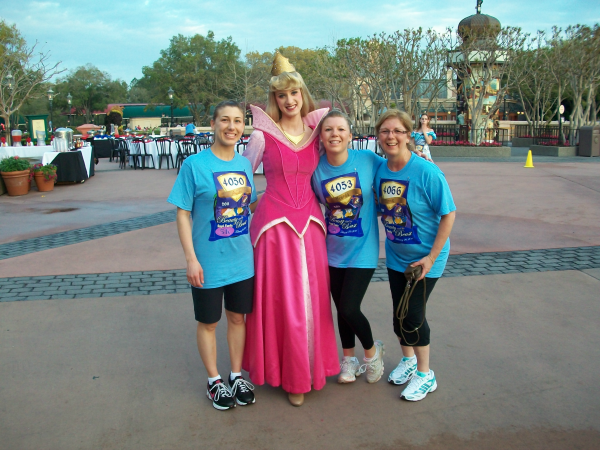 In 2012 we were back in Disney for the Princess Half Marathon Weekend Again. 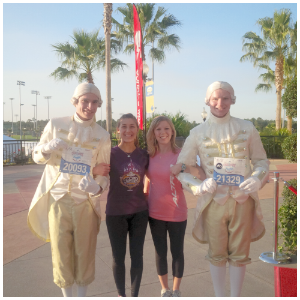 This time we brought our dad with us to run the Royal Family 5K and my sister was prepared to run the Half Marathon. Since I knew this was a weekend dedicated primarily to woman, I called Run Disney several weeks before the race to see what color the 5K t-shirts would be. I was hoping for my dad’s sake that they wouldn’t be pink or some other girly color. I found out that they were going to be white. I also found out that they always try to keep the t-shirts a neutral color since it is a family run. For months prior to this race I was trying to determine what the theme of the race would be this year. Out of process of elimination, I knew it wasn’t going to be Beauty and the Beast because that’s what it was last year, the year prior it was Princess and the frog, and the very first year it was loosely based on Cinderella. So this year I had it narrowed down to two I thought it would either be Tangled, because that was the new film coming out, or possibly Little Mermaid, since that was the film coming out of the video vault that year. Turns out it was Tangled, which I had a strong feeling it would be. The three of us girls all bought tutu skirts to wear this year for the 5K, but after carefully examining myself in the mirror with my skirt on, I decided that it wasn’t quite the look I was going for. I looked silly. I just don’t think it was the right skirt for me. So, we all decided to forego the skirts for the 5K, and my sister would wear one of them for the half marathon. We arrived on Thursday evening and were up and ready for the expo on Friday Morning. Although I feel Disney does it up, I felt that they did skimp on some little detail this year. Last year we got little backpacks, a goody bag, and free tickets to play miniature golf. We didn’t get any of that this year. All we got was our T-shirt, which I am happy for, don’t get me wrong. 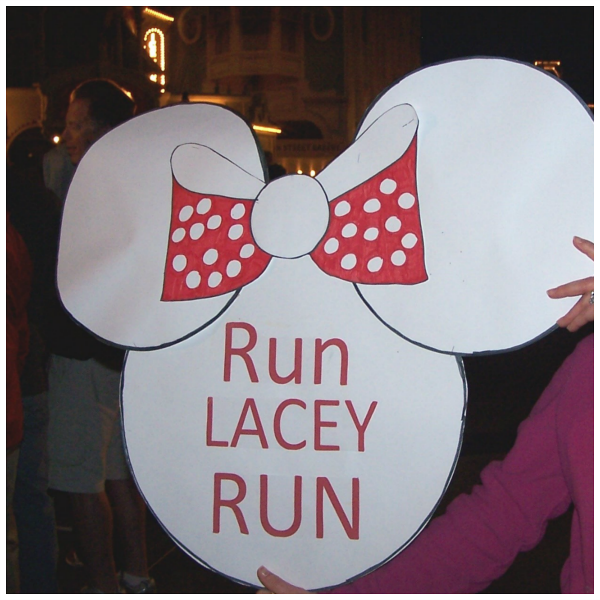 If I wouldn’t have participated in a Disney race before, I would have never known the difference. The expo is full of vendors and official Run Disney merchandise. There were many of give-aways and free samples; fruit, luna bars, etc. and raffles. When we got home, my mom got a call that she actually won one of the raffles. She won an I-pod touch! There were also guest speakers. Since ESPN is part of the Run Disney events, one of the speakers was Sage Steele from ESPN. ESPN was following her for the weekend because she was running the Princess Half Marathon. It is 4:00 am and we are up for the race. The buses start running at 5:00 am and you have to be in the parking lot by 6:15, and the race starts at 7:00. The morning of the 5k race started much like last years; up early, breakfast, head to bus stop. We had the same exact walk from the Epcot parking lot to the start corals. Since we had done this last year, we knew what to expect this time. We didn’t get our pictures done with Rapunzel and Flynn because the line was just too long. We thought maybe we could do it after the race since they were suppose to come back out for photos then too. The dj’s and their music were as uplifting as they were last year, maybe even a bit more. As we were ushered into our corral, the dj introduced us to a lady who had a remarkable story. Her name was Kimberly Sheenin. She told her story of how she was in a horrible car crash and was left a quadriplegic. Doctor’s didn’t think she would ever walk again, but through the power of prayer and help from her therapy team she did! After she learned how to walk again, she wanted to challenge herself to see what she could do next. She wanted to complete this race. Her therapy team said they would do the race with her. They all crossed the finish line together in less than an hour. Here is live video of her inspirational story. Soon it was time for the national Anthem, and a display of fireworks signaling the start of the race. I hate to admit this, but I am the slowest runner in my family. So the plan was that my sister and mom would run together, and my dad and I would run together. My dad has never done a race before so he wasn’t feeling very confident and was going to hang back with me so I had someone to run with. Well, it turned out that this became a friendly competition between my dad and my sister. ( I am proud of him for he had been training for this for a while). So of course my mom hung back with me again this year. I lost her somewhere around the UK, but caught up with her again as we entered future world. I know this race is just for fun, but it did make me feel a tiny bit better when I was running over the bridge in France and still saw all these people just now making their way into Mexico. It is just so amazing to see the park filled with so many runners! When we had less than a half mile to go, this one girl decided she was going to take a detour and not run AROUND the fountain to spaceship earth, but cross right through it! We crossed the finish line and we had shaved three minutes off our time from last year, but we stopped last year and got pictures with all the characters. At the finish line we looked for my sister and dad, and then walked over to get our finishers medal. If you want to be a spectator, there is a stand of bleachers set up for people to watch. We then got drinks and a goody box. It wasn’t even near 8:00 yet, so we had more than an hour before the park ( Epcot) opened. We thought it senseless to ride the bus back to the resort and then hope back on to come to the park. So we passed the time like so many others. We ate our snacks, took pictures, and watched the other racers cross the finish line. One of the great things about watching a Disney race is the unique costumes you see. One of my favorites was a lady who was dressed as Mary Poppins. She even ran in her big hat! Another cute one was a father and his daughter (she was about 10). She was dressed as Belle and he had a full Beast costume. I’m sure he was warm in the morning, but by the end of the race, he had to be hot. What was one of the most unique Running Costumes you have seen either at Disney or elsewhere? 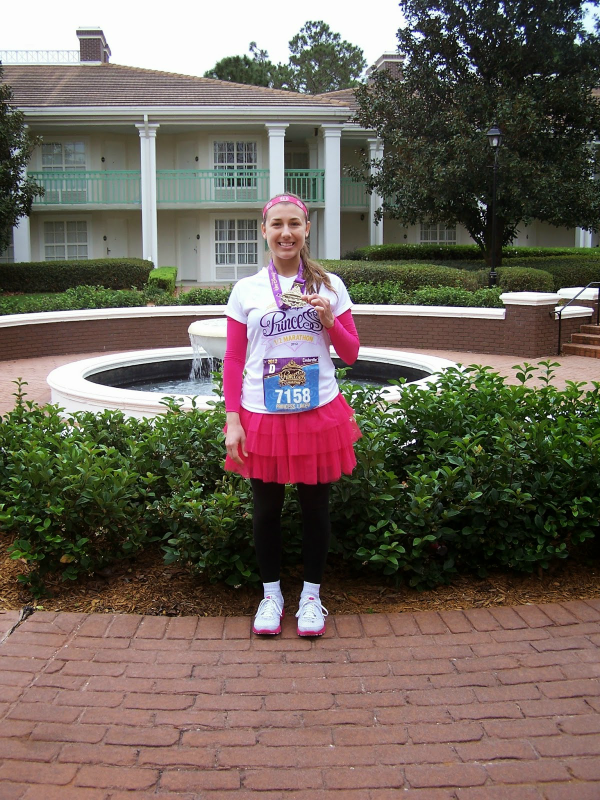 Disney Princess Half Marathon Weekend 2011: Where it all began! 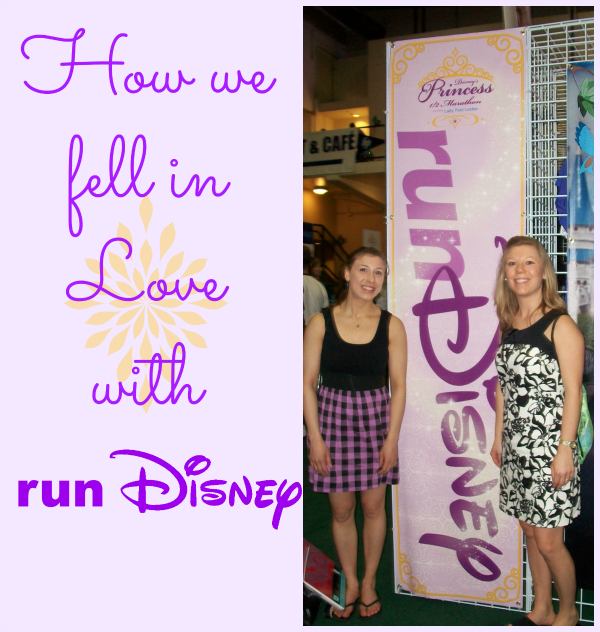 Our love for running started with the Disney Princess weekend of races at the Walt Disney World resort in Florida. 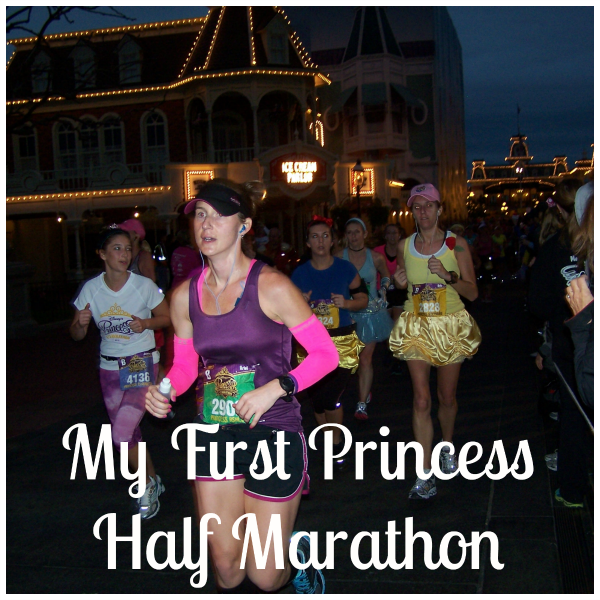 We say Disney’s Princess Half Marathon Weekend is where it all began! This is probably our favorite group of races. 1) because we love Disney of course and 2)because it was the first race we ran as a family. Here is how our love of Disney races began. I am always searching the web for new things to do and one day I just happened to learn about this run at Disney. 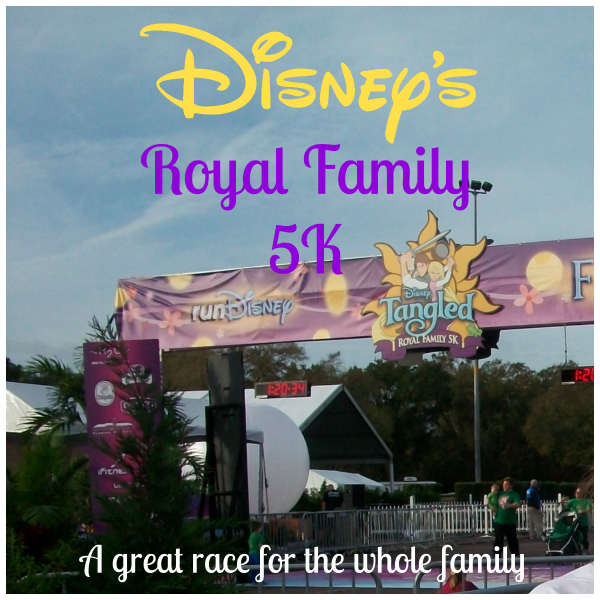 It was called the Royal Family 5K. I consider myself to be in pretty good shape, but I had never run a 5K before. I thought it would be fun and a great reason to go to Disney. I asked my sister and mom if we wanted to do it as a girls trip and they agreed. My sister was already a runner but this would be a first for my mom and I. We signed up for the race and we found out that the race had a pacing requirement of a 16 minute mile. At the time, I didn’t really know what that meant, but my sister assured me that I could certainly do one mile in 16 minutes even if I was just walking my normal pace ( I generally am a fast walker anyway). 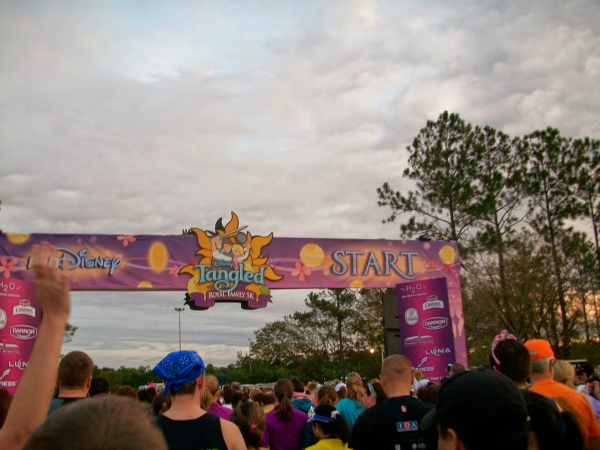 According to the official Disney rules of the race, if you do not keep up with the pace requirements, you can be taken off the course. I certainly didn’t want that happening to me. My mom walks everyday so she slowly started to incorporate a jog, and then a run into her routine. I on the other hand used the treadmill. I was pretty consistent with my treadmill running. I did it all fall and through the holidays. The day before the 5K, we had to go to the race expo at Disney's ESPN Wide World of Sports. You can read some of our expo posts HERE, HERE and HERE. We were up and out of our room by 3:30 am! Disney races are VERY EARLY. One thing you should know is that the food court at your resort will not be open this early, so plan ahead. Buy something the night before, or pack something from home. There is a microwave at most resort food courts and all of them have toasters, so bringing something as simple as a packet of oatmeal and a bagel or English muffin is a good idea. After we ate our simple breakfast, we went to the bus stop and waited for the event bus to come. Yes, it was still dark out! Even though we were boarding the bus this ungodly hour in the morning, we couldn’t help but smile as we walked on. Runners were dressed in costume! We hadn’t even thought of this. We saw lots of princesses, Woody and Jessie from Toy story, and many of tutu! 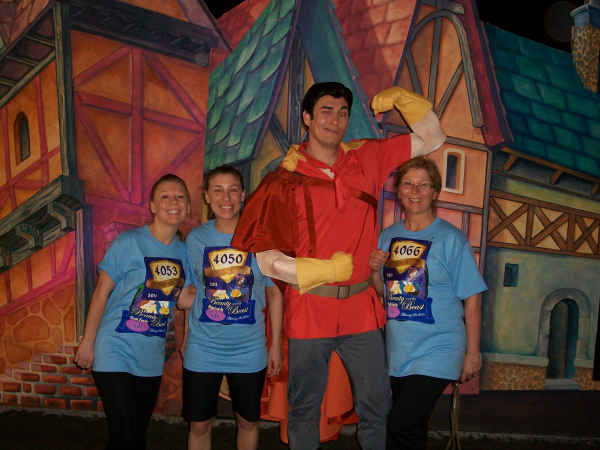 Even though we didn’t dress in costume, we didn’t feel out of place because we saw others that were wearing their Beauty and the Beast race t-shirts as well. 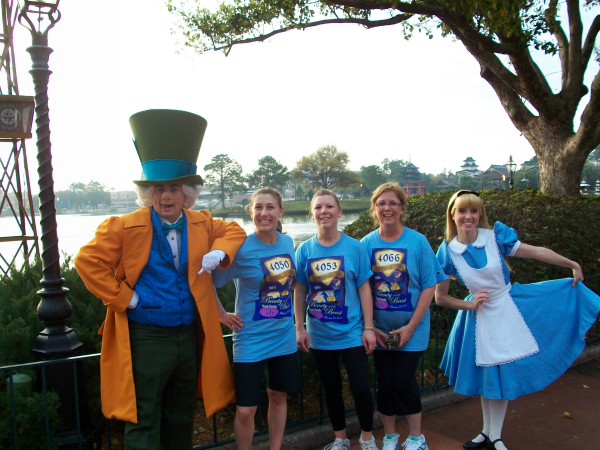 Some people were even wearing t-shirts from previous non-Disney races. The bus dropped us off in the Epcot parking lot and we had a pretty long walk to get to the staging area. There is also a bag check area if you have a bag to check ( you have to put it in the clear plastic bag you get at the expo). We did not. 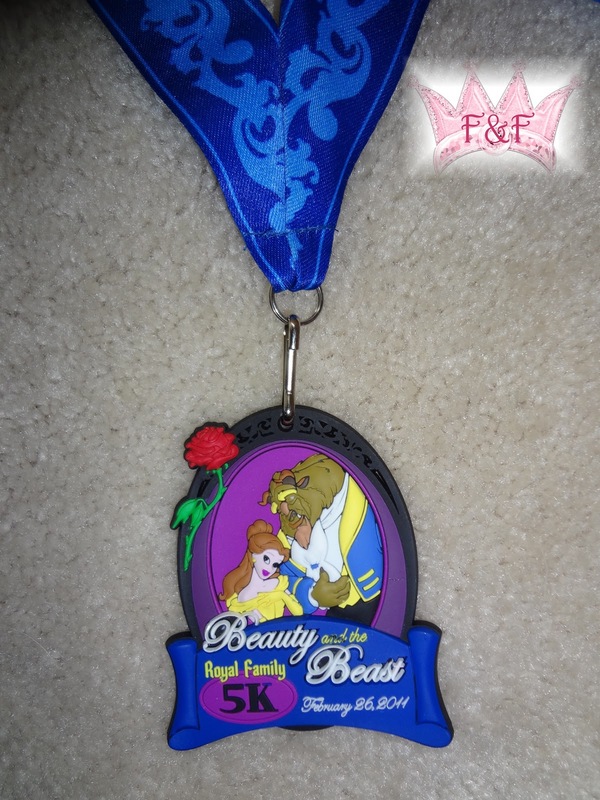 Once we got there, there was a sea of people, a DJ playing uplifting music, and character photo opportunities with Belle and Beast of course, and Gustan was there too. I have no idea why we pinned our bibs up so high! Belle and Beast had left while we were standing in line and were replaced by Gustan, so that is who we ended up getting a picture with. We hung out in the parking lot for quite a while before we got into the coral, but the Dj’s did a good job of keeping us entertained and psyching everyone up for the race so there was never a dull moment. Buy the time we were in the coral and ready to start, the sun just started to come up. As is the protocol for any Disney race, it began with a fireworks start! 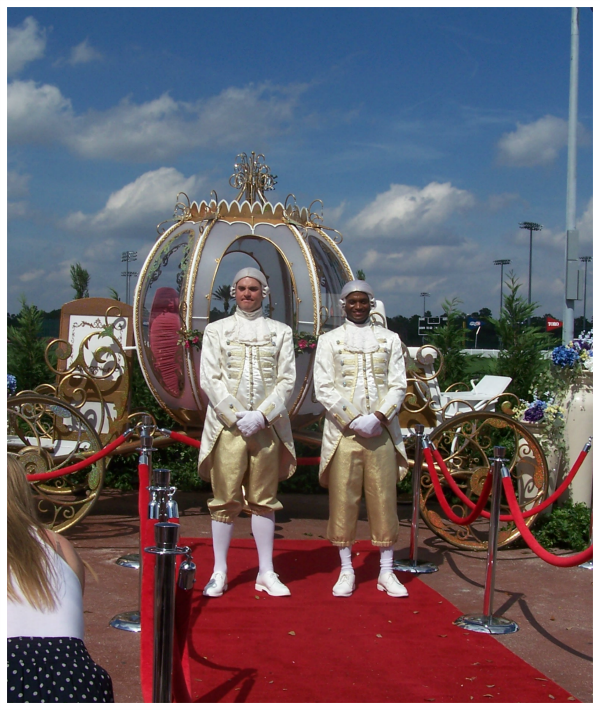 Before arriving at WDW, we knew that there would be on course entertainment and opportunities to stop along the way and take pictures with characters. However, I knew I wanted to do my best at this race and I didn’t want to lose time stopping to take picture so the three of us agreed that we would run straight through. Shortly before the race started, my sister was engaged in conversation with a group of girls who had run the race last year and they gave her a bit of advice. They said that they ran straight through last year because they didn’t want to stop, but looking back they wish they would had just had fun with it and taken lots of pictures. That was their plan for this year. After hearing this, we changed our minds and I am so glad we did. This race wouldn’t have been the same if we didn’t stop and get the pictures that we got. We still ran our best, we didn’t lollygag or anything. We were able to meet Snow White and Dopey, Sleeping Beauty, Jasmine and Aladdin, Pocahontas, and Alice and the Mad Hatter. I believe Mulan and some others were near the China pavilion, but since that is near the beginning of world showcase and the first character stop, that line was too long. This 5k course starts in the parking lot of Epcot and the first mile is literally through the parking lot and on a back road. Once you finish the first mile, there is a digital sign that will tell you how many minutes it took you to get there from the start line. This first mile marker is located a little ways before the employee entrance to World Showcase. Once you get to world showcase, you will enter from behind Mexico. This is the first time during the race you will be running through the park. I have to admit the first mile is really boring, but this is where is really starts to get exciting. The music is playing throughout the countries, and characters are now lined up in the countries as well. The first water stop is on the right hand side right after Mexico. Being the type A persona I am, I read the race guide cover to cover the night before and it kept stressing how important it was to keep hydrated and you should take advantage of every water stop. I did stop at both water stops along the way, and I probably didn’t need to. I was just being cautious! Just as we are running past France, there is a slight incline as you have to run up over the bridge. You would think that you are now heading to the United Kingdom right? But not so fast. We take a left and run around the international gateway. This is now Mile 2. A little over one more mile to go. As you get around the international gateway, there is a second water stop, and of course I grab one! At this point we are behind the scenes again and then re- enter world show case somewhere around Canada. We continue towards Future world. We run on the left side of the Epcot ball, and then around it on the right side. A little ways after the Epcot ball there is the 3 mile marker. We have .1 to go. I think this .1 is a lot shorter than it actually is. There is a girl beside me looking at her Garmin and he said she had already gone 3.3 already. Someone must be off. So my sister, mom, and I all cross the finish line with pride. We did it. My mom and I finished our first 5K race. Even though this isn’t considered a timed race, there is a race clock there. Even with all the stops we made, we were still quite happy with our time. 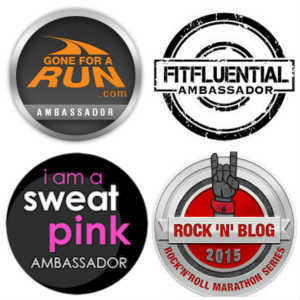 We make our way down the chute and our presented with our 5K medallions. The line continues as we are supplied with bottled water, Gatorade, bananas, and a goodie box of snacks. We had so much fun doing this race, but it isn’t nearly as serious as I thought it was. But who knew, I’d never done it before! Even though there is a pacing requirement, I hardly doubt anybody gets picked up off the course. There is a small grand stand area there were spectators can watch the runners. We watched for a while and even after one hour there were people still crossing the finish line. You Can read all about our other Disney races HERE. What was your first race and how did it make you feel?